EURUSD is chiefly under the influence of upcoming presidential elections in France and the German Manufacturing PMI. 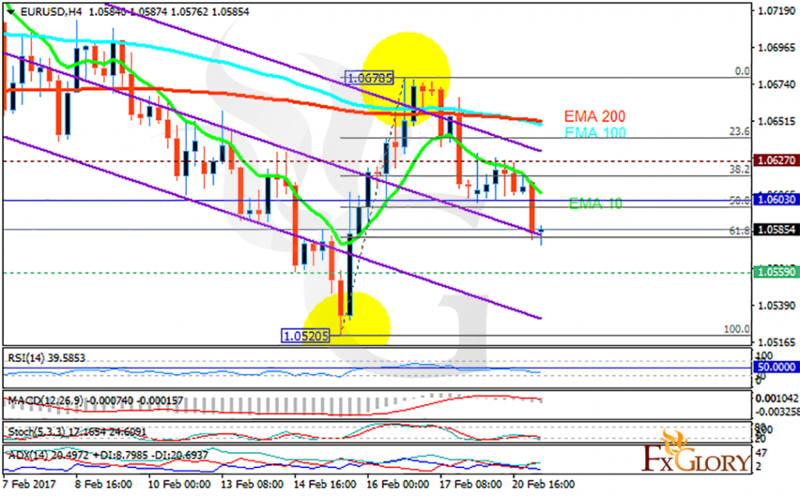 The support rests at 1.05590 with resistance at 1.06270 which the weekly pivot point at 1.06030 is located in between the lines. The EMA of 10 is moving with bearish bias along the descendant channel and it is below the EMA of 100 and 200. The RSI is falling towards the oversold area, the Stochastic is moving in its low ranges and the MACD indicator is in neutral territory. The ADX is not showing any clear signals. Since the pair has reached the 61.8 level of Fibonacci retracement, the resistance level breakout will be a good sign for buyers to target 1.0700 otherwise the pair will continue its bearish trend targeting 1.0600.